This outcome-based text offers principles and skill-building experiences for the critical competence of listening. It serves as an adaptable supplement for courses in communication and professional studies. It draws from the author’s HURIER model, which identifies six interrelated components of listening—Hearing, Understanding, Remembering, Interpreting, Evaluating, and Responding—and considers the skills required to achieve the specific outcomes related to each. Varied classroom activities, including discussion questions, group processes, and other instructional strategies, facilitate skill building and the achievement of each listening outcome. The final section of the text identifies those outcomes that are particularly relevant to specific career applications and provides cases to facilitate discussion and illustrate listening challenges in each field. The outcome-based, modular format allows instructors maximum flexibility in adapting instructional materials to meet the needs of specific courses and time frames. The Listening Advantage is an invaluable supplement for courses in communication studies and professional fields including education, healthcare, helping professions, law, management, and service. 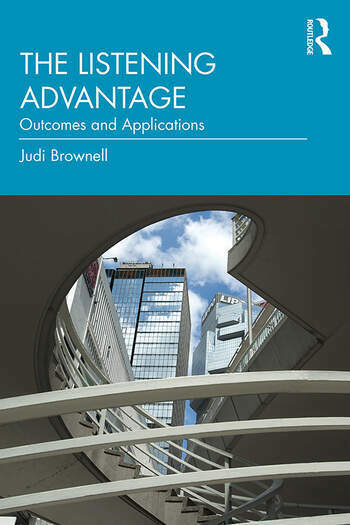 Judi Brownell is a professor at Cornell’s School of Hotel Administration, SC Johnson College of Business. She teaches courses in organizational behavior, human resources, and management communication. She has extensive international teaching experience and her online eCornell executive courses are taken worldwide.